Struts 2 is my favorite Java web framework these days; it's REST-friendly, simple, easy to use, very flexible and the only thing it has with its creaky old Struts 1.x parent is the fact that it's an action framework rather than a component framework like JSF. As most of my readers probably already know, Struts 2 is based on WebWork/XWork the framework that powers JIRA and Confluence, two of the coolest Java webapps around. Apparently, I'm not alone in this thinking -- I keep on running into folks at JavaOne who feel the same way. But unfortunately, Struts 2 docs are lacking, so I was very happy to see two new books on Struts 2 at the JavaOne bookstore. 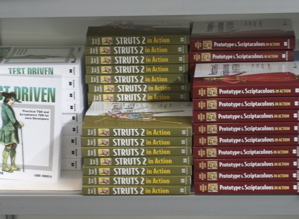 There's Struts 2 in Action, a rewrite of the classic Manning book, and Practical Apache Struts 2 Web 2.0 Projects from Apress. I picked up a copy of Struts 2 in Action on Monday and it looks great so far, but I've only skimmed it. I'll let you know what I think once I dig-in on the flight home. If you're at JavaOne, check out TS-5739 - Hands-on Struts2 by Ian Roughley (author of the Apress book) today at 10:50 AM in Esplanade 307/310.